According to new reports, Lamar Odom has suffered physical and mental setbacks in his recovery. Lamar Odom, 35, has undergone two emergency surgeries that have left him in a “fragile” mental state, unidentified sources told TMZ.com. The procedures involved chest issues, the gossip website said. Doctors now are turning away all visitors except wife Khloé Kardashian, TMZ said. Khloe Kardashian got some public support on October 22 from Lamar Odom’s family – a day after a Los Angeles judge agreed to dismiss the formerly estranged couple’s pending divorce. “In SINCERELY loving Lamar, we truly love and respect whomever he loves,” said the statement from Odom family spokeswoman Alvina Alston. “We always have and will continue to do so. Together as a team, we will support and encourage him always,” she said. Alvina Alston gave a positive update to Lamar Odom’s medical progress that didn’t mention any surgeries. “To our overwhelming delight, Lamar’s courageous improvement continues on the incline in Los Angeles. He is beginning to gradually flourish both mentally and physically,” she said. Lamar Odom was transferred to Cedars-Sinai Medical Center in Los Angeles on October 19 after waking from a coma on October 16 at Sunrise Hospital in Las Vegas. Khloe Kardashian, 31, rushed to Lamar Odom’s side the same day he was admitted in extremely critical condition and has kept a vigil. She even missed Kim Kardashian’s birthday celebration October 21 to stay with Lamar Odom. 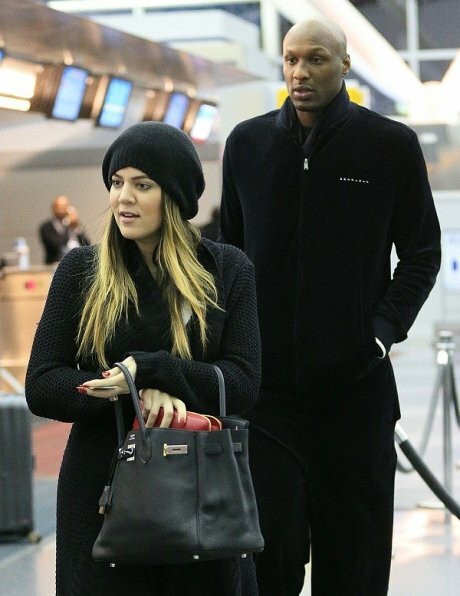 Lamar Odom reportedly told Khloe Kardashian over the weekend that he understood he almost died and had hit rock bottom.